Turning spaghetti sauce into sloppy joes is a quick and easy short cut! 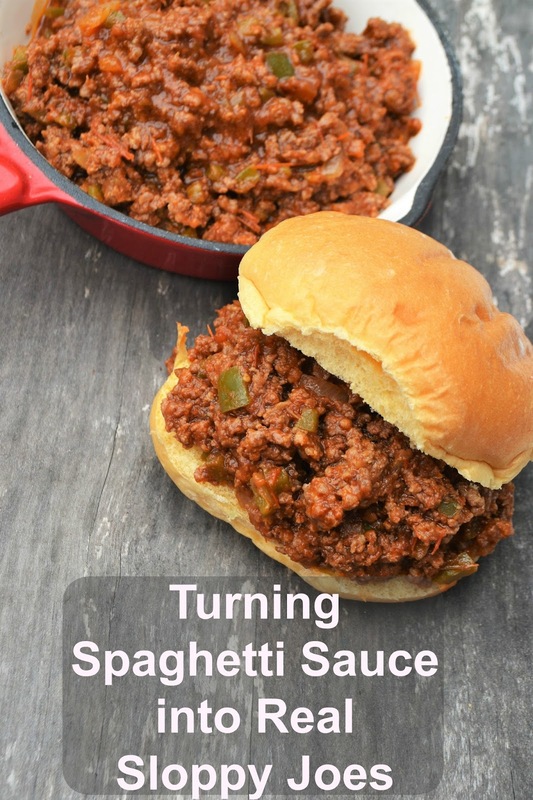 I have 2 ways to help you turn pasta sauce into scrumptious sloppy joe sandwich's your family will love! First up, will be turning leftover spaghetti and meat sauce into sloppy joes, then I'll share how to grab a jar of pasta sauce off the shelf and make it from scratch as a quick short cut with fresh hamburger. No need to buy a can of sloppy joe sauce! This will be delish! In saucepan over medium heat, reheat spaghetti sauce. If sauce is too "liquidy" let sauce reduce to desired thickness, stirring frequently, for a few minutes. Stir in vinegar, Worcestershire sauce, brown sugar, and pepper. Spoon mixture onto hamburger buns and serve. In large skillet over medium heat, add oil, onion and bell pepper. Cook stirring occasionally 5 minutes till they begin to soften. Add garlic, stirring additional minute. Add pasta sauce, vinegar, Worcestershire sauce, brown sugar and pepper. stir to combine. Bring to a simmer, then lower temperature to low and cook till thickened, about 5 minutes.